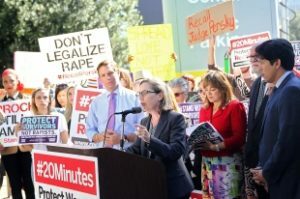 Michele Dauber, Stanford law professor and chair of the Recall Persky campaign, speaks during a rally in downtown San Jose following the Sept. 2, 2016, release of Brock Turner, who served half of his six-month sentence. Photo by Veronica Weber. The campaign working to unseat Santa Clara County Judge Aaron Persky, sparked by his sentencing of former Stanford University student Brock Turner to six months in county jail, released this weekend a detailed statement criticizing a state judicial commission that recently cleared him of any misconduct.